For nearly two years, Wanona Satcher has had visions of leg-warmer-clad sugar plum fairies salsa dancing in her head. 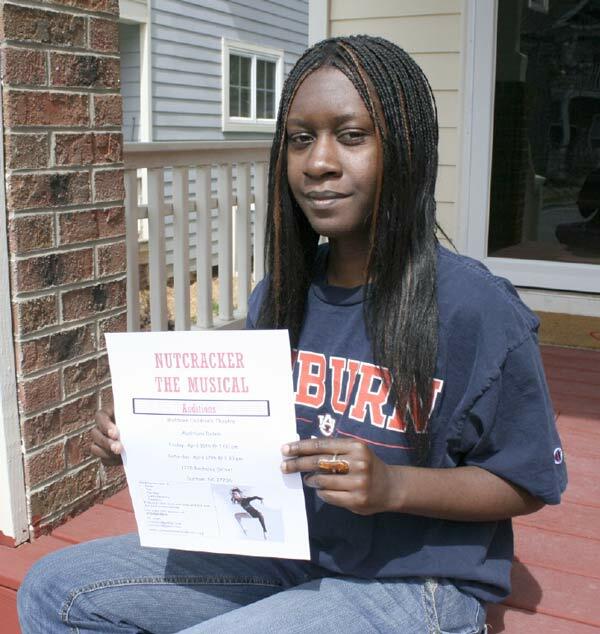 Wanona Satcher, shown here on her front porch near Eastway Elementary School, can’t wait for auditions for "Nutcracker, The Musical." Satcher masterminded a new take on the classic, incorporating 1980s-themed costumes and a variety of dance styles to expose children to a variety of artistic forms. Staff photo by Terri Flagg. And as auditions approach, Satcher’s dream is finally becoming a reality. Satcher, 28, came up with the idea for the musical as a way of celebrating diversity and exposing local youngsters to a broader range of the arts. Satcher’s version of the familiar Christmas ballet, set and costumed in the 1980s style, emphasizes diversity by incorporating six types of dance: classical ballet, salsa, Capoeira, contemporary/jazz, tap and hip-hop. “I wanted the kids not only to be influenced by ballet but to also showcase their style,” she said. Auditions are open to people ages 6 to 23 and will be held at the Walltown Children’s Theatre at 1225 Berkeley Street in Durham Friday, April 16 at 7 p.m. and Saturday, April 17 at 1:30 p.m.
“We want students from all over,” Satcher said. Those who wish to audition should bring their own accompaniment; be able to sing, act and dance, and they should know their vocal range, Satcher said. The musical will be performed Dec. 11 and 12 at the Holton Career and Resource Center, Satcher said. Satcher, an architect who moved to Durham from Pinehurst, said she wanted to do something to bridge the gap between the two towns’ experiences of the arts. “I’m right in the middle and I’m seeing what’s lacking on both sides of the section,” she said, adding that the children in her Durham neighborhood were missing out on learning the classics like ballet, but those from more affluent cultures like Pinehurst miss out on learning about ethnic dances like Capoeira, a Brazilian art form that combines dance and martial arts. With two young cousins who are the only African-American dancers at their Pinehurst ballet school and who often visit Satcher in Durham, this is something Satcher frequently witnesses first hand. Satcher thought a good way to merge the communities would be through a musical. One element Satcher is particularly excited about in her retelling is the fight scene between the Nutcracker and the Mouse King. In Satcher’s version, it will be performed with Capoeira. Satcher, who has no dancing or play production experience, found the perfect partnership with Cynthia Penn and Joseph Henderson from the Walltown Children’s Theatre. Penn and Henderson are working on the script and choreography of the production. The co-directors want to use the unique production to celebrate the 10-year anniversary of the children’s theater, which was founded in 2000. Penn explained why she was enthusiastic about working on the musical. Another goal of the production is to provide students with a realistic picture of what it takes to succeed in the arts. Satcher is thrilled that things are finally under way.